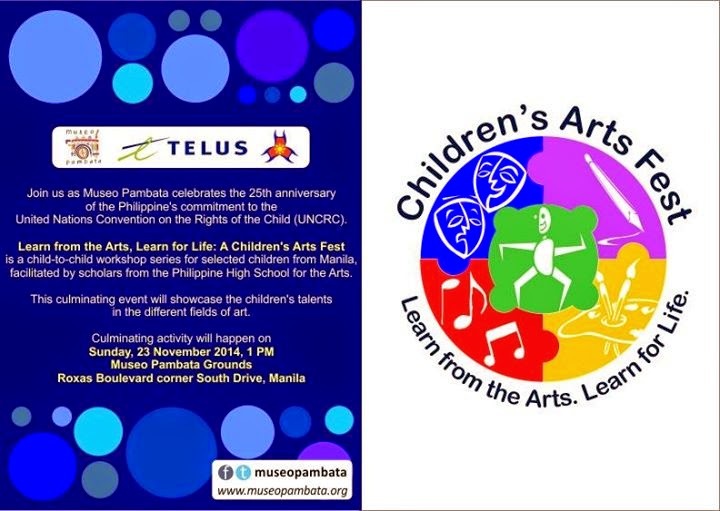 Museo Pambata will hold Children's Arts Fest: Learn from the Arts, Learn for Life on November 23, 2014 (Sunday) at 1pm to commemorate the 25th year of the Philippines' commitment to the United Nations' Convention on the Rights of the Child. The festival will be held at Museo Pambata along Roxas Boulevard corner South Drive in Manila. Planning and preparation for the Children's Arts Fest has been in the works for a year and the festival is the culminating activity of the Learn from the Arts, Learn for Life project, a collaboration between Museo Pambata Foundation Inc. and the Philippine High School for the Arts (PHSA). The project began with 12-day art workshops for 80 selected child beneficiaries from different communities and organizations in the City of Manila from September to November 2014. These workshops were facilitated by third year high school art scholars of the PHSA. The project is funded by the Community Board of Telus International Philippines. The festival will feature an art exhibition, theater, music and dance performances, a book launch and a kite-flying activity at the Luneta Park. Gates will be open from 1 to 5 p.m.
Museum entrance fee is Php 150 but admission to the festival is FREE. You may contact Museo Pambata for more info: call 5231797/98 (local 103) or e-mail info@museopambata.org.